Although I doubt my guide to preparing a horse for a show will suddenly have you winning every event at shows, good presentation in the show ring is very important. If two horses are equal in every way, the horse that presents the better picture will win, and this is when every little tip or trick you find out can be so important!! These articles are aimed at the new competitor - after only one year of showing myself I am far from qualified to advise the super-experienced ;-). At any level of competition, a clean horse is a necessity. Even if the class does not require braiding or plaiting, showing your horse covered in mud or with a matted tail is disrespectful of the judge and organizers at a show. To wash your horse tie him up in a clear area (most horses don't like standing still and you probably don't want your horse knocking everything within sight over) with easy access to a hose or at least water. A specially built wash bay is ideal, but not all of us (including me!) are lucky enough to have one of these, so anywhere that is unlikely to get overly muddy will have to do (See Pic. on right of Tisca during his bath). You don't have to use a shampoo especially manufactured for horses, although some of these are very good. I use a medicated horse shampoo as Tisca tends to get dandruff etc, but otherwise you can save a lot of money by using alternatives. Human shampoo is fine, and some of them smell really nice! I have a friend who uses woolwash on her grey - this had amazing results and worked better than the expensive horse stain remover she had been using. I have heard of using dishwashing detergent, but I would be careful if your horse has sensitive skin. There are lots of spray on show polishes that are available, like Show Sheen that are great on tails. Spray on human leave-in conditioners are also excellent, like Infusion 23. Anyway, start your horse's bath with wetting his mane and tail thoroughly. You can do this with your hose, or if you're unlucky by lugging buckets of water around. You can hold the bucket up under the tail and totally dunk it in to really get it soaked. Pour shampoo along the length of the tail and mane, and really work up a lather with your hands, or one of those nifty grooming gloves, concentrating on the dock for the tail and the roots of the mane. Make sure you don't forget the forelock by combing it back into the rest of his mane. This way you won't get shampoo in his eyes. I take the end of Tisca's tail and rub that into the top of the dock to really work the shampoo through the whole tail. Once the shampoo is worked through, thoroughly rinse it out and then apply conditioner. If you are plaiting (braiding) the mane don't touch it with the conditioner!! Believe me, it isn't fun trying to plait a slippery mane. The same goes for the tail, although only the bit up the top (the dock) where you will be plaiting, although if it is pulled, you can condition the lot. Always condition the rest of the tail as it gives it a sheen and gets rid of lots of tangles. Once you've rubbed the conditioner in, comb (see below) through the tail (and mane if you aren't plaiting) and leave it in while you do the rest of your horse. Alternatively, after you shampoo the tail you can spray it with Show Sheen while it is still damp, or with a leave in conditioner. But still make sure that the tail is free of knots by gently combing through the tail (hold firmly onto the hair just above where you are combing so you don't rip it out). Although I always wash Tisca's mane and tail before a show, a lot of people either wash their horses mane a few days before, or alternatively not at all. This makes the mane less slippery, and easier to plait. I tend to drag friends along to help me wash Tisca, or a friend and I will help each other do each other's horses. If you have two people cleaning the body is much quicker and easier. Each take one side and really wet it. You can only do this if you put your finger partly over the hose to increase the pressure of the water otherwise you only dampen the top and don't get to the dirt at the skin (but don't over do it). Pour shampoo along your horses back and hindquarters and work up a lather with your big sponge (this is when they're *great*!). Make sure you clean everywhere - don't forget to clean his belly and between his front legs. Also don't forget your horse's face. If he won't tolerate being sprayed with water on his face (many won't) then try trickling water down onto his face from between his ears, with the hose behind his head. And if this won't work, get a non-soapy sponge and clean his face as best as you can. I don't like using shampoo on my horse's face as I'm worried I'll irritate his eyes. When your sponge is very foamy you can use that to clean your horse's legs, making sure to clean right behind the pastern. If your horse has white leg markings, make sure you get these *really* white. This is when I think that the 'purple' horse shampoos, like 'Glo-White' are just fantastic, although wool wash does okay and I know people who practically worship Decore's 'Magic Silver White', which is a human blueing rinse or something. Tisca's sock (on the left) had just been washed using Equinade Glo-White shampoo. To keep his socks clean at the show cover it in baby powder which really makes them glow, and if it gets dirty will just just brush off, leaving a clean sock beneath. Now that your horse is covered in foam and pulling faces at you for making him stand still for so long, you can spray him with water to rinse off the shampoo, as well as the conditioner you've left in his tail. As you rinse off, use the sweat scraper, and if foam is still coming off when you rub the hair backwards with your hand, then you have to rinse some more. I don't normally condition Tisca's body, but instead spray on a product similar to show sheen while his coat is still damp. Make sure that with any silicon-based show polish, like Show Sheen, that you don't spray it onto the area where the saddle goes. Before you let your horse loose in his paddock or put him back in his stable, make sure he's rugged (blanketed). A rug and neck rug or hood is essential if you don't want to cancel out all your hard work! For a show hack, a full body clip is pretty much essential if you are planning on showing through winter, and where I live, the show season is mostly during winter, so a body clip can't be avoided for hacking. However, if you will be body clipping your horse he will have to be stabled and his rugs carefully monitored so he is never too hot or too cold. 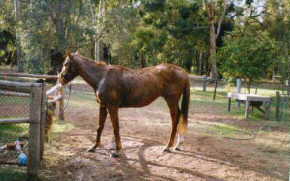 It wouldn't be fair to fully body clip a totally paddock kept horse. However, some horses keep a very short neat coat throughout winter if carefully rugged, and this could be an option if you're lucky enough to have a horse like this. 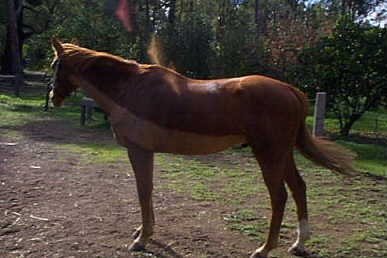 For most other types of showing, clipping can be over only parts of the body, or even not at all. Make sure you consider what level and how much you will be competing before you clip your horse, as it adds extra work for you and you also don't want your horse to be cold. A hunter clip, where the hair is removed everywhere but the legs is a good option if you have a fully rugged horse that lives in a paddock. Although unsuitable for hacking, this sort of clip is perfectly acceptable for most other equestrian sports. I trace clipped Tisca last season, as he was being worked hard enough to warrant it, and he was rugged. However, he looked quite odd, so I wouldn't reccommend this type of clip if your horse's beauty has anything to do with judging. There is a photo of Tisca trace clipped here. .
Clipping is normally done by someone you pay to turn up and clip your horse, using expensive, heavy duty, clippers. It can be done with cheaper battery clippers, but apparantly it takes ages and the result isn't as good. If your horse hates being clipped (like Tisca)he may have to be drugged, and in my case, I'm clipping Tisca myself with quiet battery clippers this year, as it is the noise that stresses Tisca out. You can use battery clippers for most of the trimming jobs mentioned below, to create a neater finish then using scissors. Clipping out white socks makes them look brighter and whiter, and trimming around the coronet band creates a neat finish. If you're planning on plaiting (braiding) your horse's mane you will need to have it pulled to a length of at most 10 cm. How thick you have the mane depends on the style of plait/braid. Refer to the Plaiting and Braiding section for more information. To pull the mane you first thin the mane with a thinning comb. This is quite a long narrow comb with the teeth much closer together then in a 'normal' mane and tail comb. By combing through the mane with this for a few days you will thin the mane slightly, but to have it even, it must be pulled. Using a normal mane comb, comb down a section of mane (I start near the withers and move up) and then hold onto the longest strands with your non-comb-holding hand. Brush upwards in this section, and all the shorter hairs will bunch up near the crest, and you will be left with a small amount of longer hairs in your hand. Grasping firmly, pull the hairs out with a swift upward motion. If you only pull small amounts and for short periods of time it shouldn't hurt the horse. Wearing a glove on the hand that pulls out the hairs I also recommend. If you're horse is truly against having his or her mane pulled, don't cut it!! Instead use a razor comb and use the same technique as previously mentioned, but cut the ends of the long strands off (from beneath) using the razor comb. This creates a much less artificial appearance then a cut mane. As I plait Tisca's tail I don't know the correct technique for pulling a tail. I always 'bang' his tail - cut straight across the bottom - so that when he moves it is carried about four inches below the point of his hock. Removing excess hair from your horse's face creates a much sharper appearance, whatever event you will be competing in. 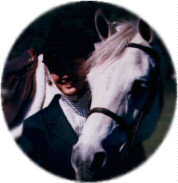 In the photo on the right, Tisca and I are waiting to begin out dressage test at a One Day Event. He's plaited up with his ears trimmed and 'beard' removed. He looks very smart I think! To trim the ears, close the ear so that the edges are touching. Using scissors, trim going 'with' the hair (so trim from the base to the tip) along the edge of the ear, making sure you only cut off hair that extends past the closed ear. As my horse is paddock kept I don't clip out the inside of his ears, as some showies do, and unless your horse is fully stabled I wouldn't recommend clipping out more then a minimal amount. I never touch the hairs around Tisca's eyes, as these are very important to keep your horse's eyes free of dirt. However, I have one friend who's standardbred's 'eye hairs' (for want of a better term!) are so long the get caught up in the bridle, hurting him. So she cuts these in half, but still keeps a more normal length of eye hair. I trim Tisca's whiskers using scissors, as Tisca has no objection to me doing so, and doesn't move so I won't cut him. It takes ages this way, but you do get a very close, clean result. An alternative is to use a special horse razor. Human one's won't work!! I also use my scissors to trim any overly long hairs from along Tisca's jaw. I also trim the excess hair off Tisca's fetlocks, which can really make a horse look much neater. Also remove a 'bridle path' between and extending behind your horse's ears with scissors or electric clippers. It should start approximately half way between his ears, and extend back around 5-7cm. To avoid having a plait sitting under your saddle blanket, trim around 7cm of mane from where the mane meets the withers.